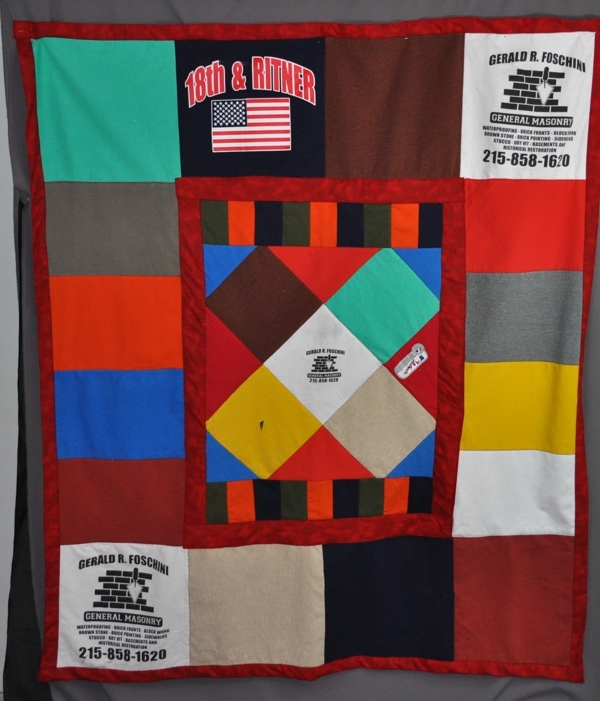 Quilting and Patchwork have been traditional ways to recycle old garments for hundreds of years. 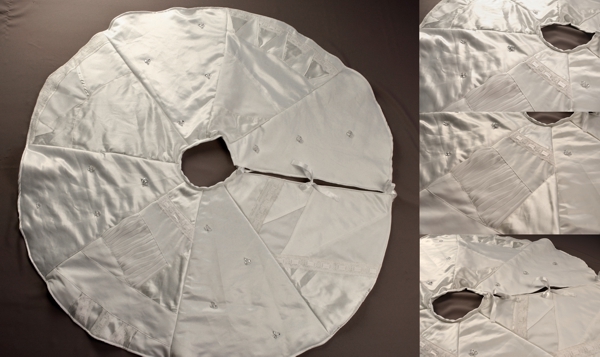 It was a practical way to use any use-able fabric from an old shirt that could no longer be worn. Now, it is a lovely way to remember the person who wore the clothing or a lovely way to remember a span of time like High School. 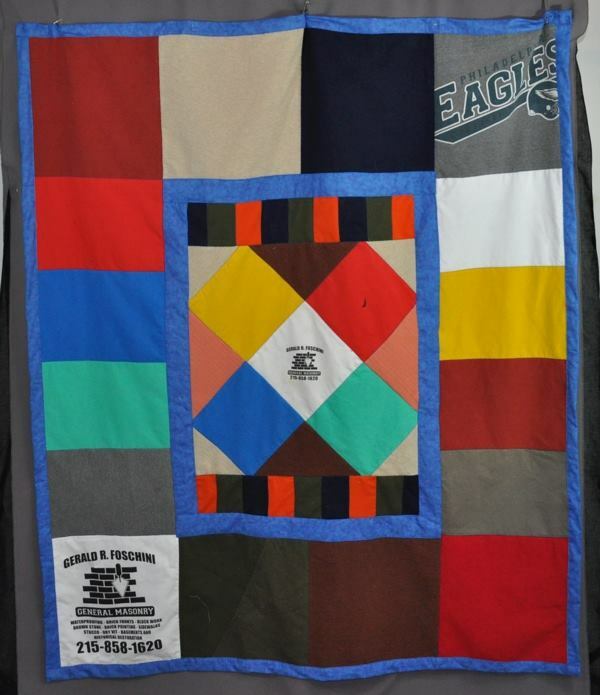 We can turn grandpa’s old shirts into blankets for family to share, hug and cuddle in and remember him by. We can take some of those band uniforms & t-shirts and turn them into a warm, comfortable blanket your high school graduate can take to college. 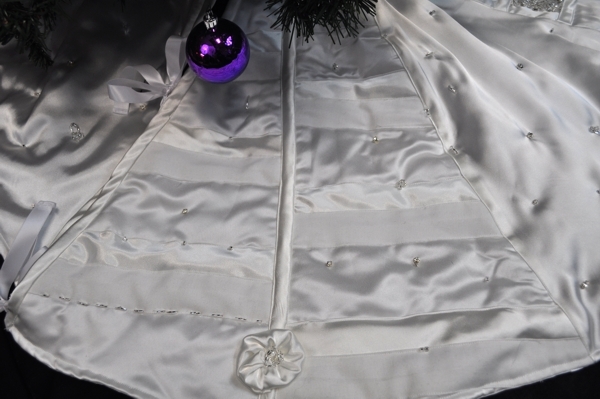 Use a wedding dress or clothing to have Christmas tree skirts made for family members. Click on any photo below to see more detail. 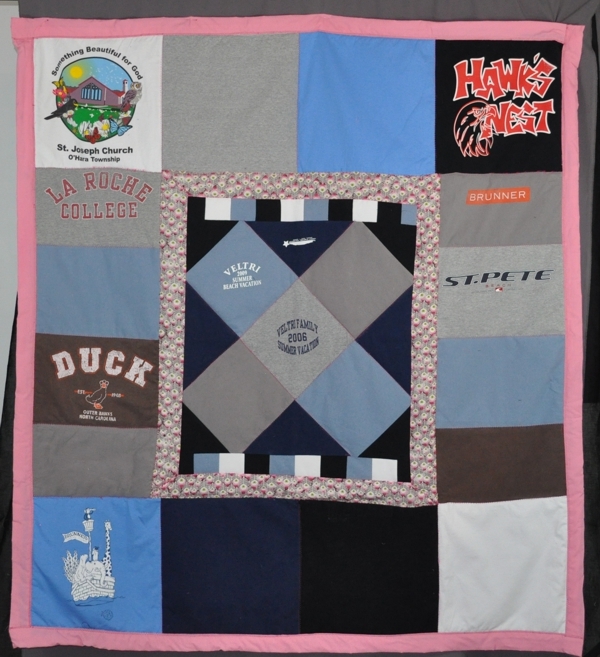 Having a baby blanket made from a late loved one’s clothing can be a beautiful shower gift and a way to include the memory of that loved one with the coming of a new generation. 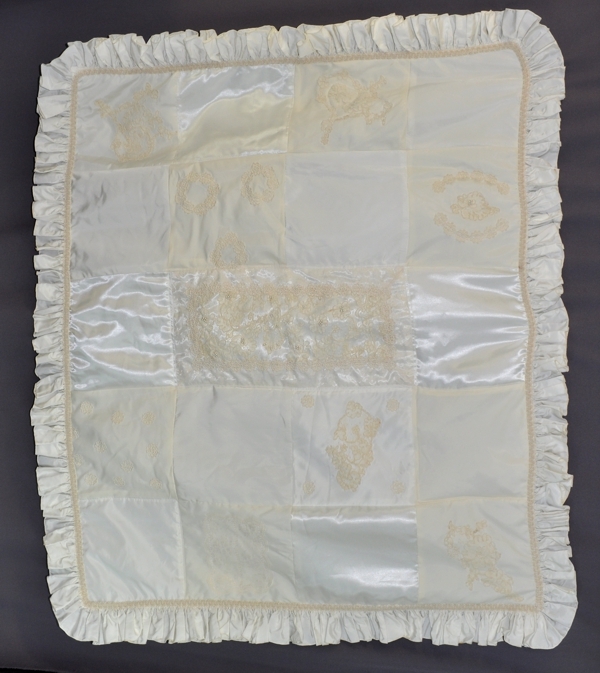 Baby blankets made from a treasured wedding dress are also a popular baby shower gift. 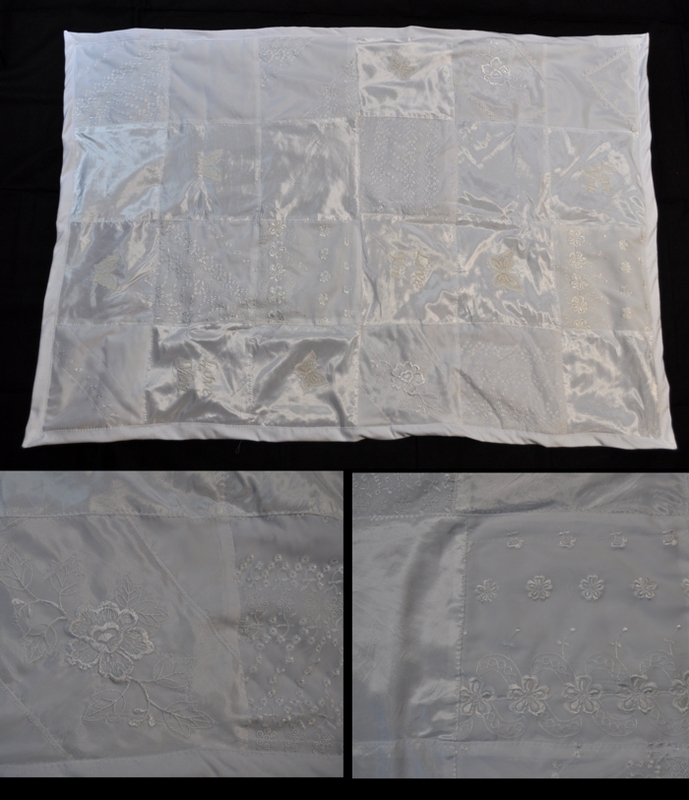 When made from wedding dress materials, these blankets are more decorative and shouldn’t be used for baby to sleep with unsupervised. 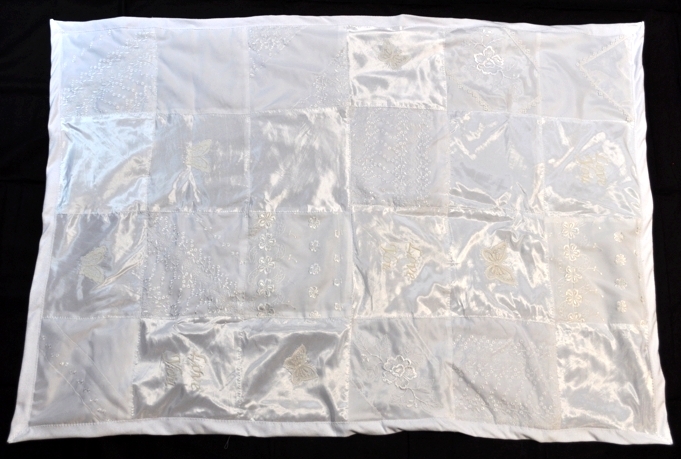 However, wedding dress fabrics make beautiful quilts. Quilts take a considerable amount of time so I have to be able to adjust my schedule to make one. 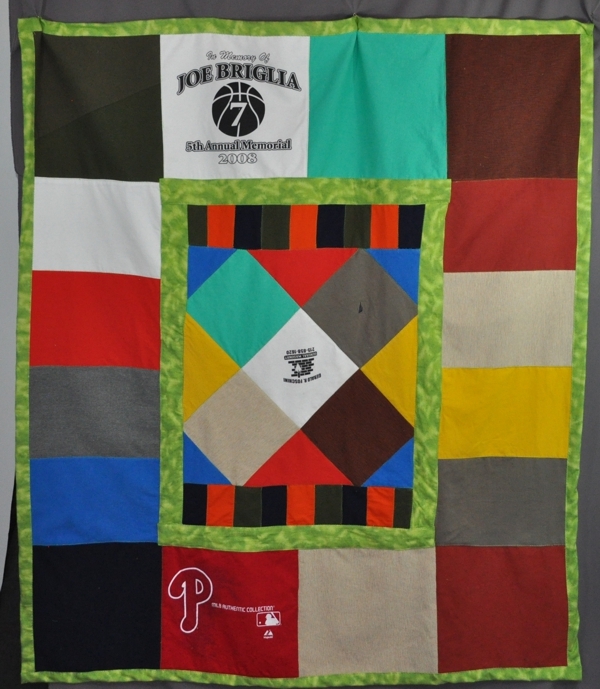 To order pillows or quilts, Click Here for a PDF Order Form for Baby Blanket (36″ x 48″) I charge $245 for a Crib Quilt (42″ x 54″) I charge $285. 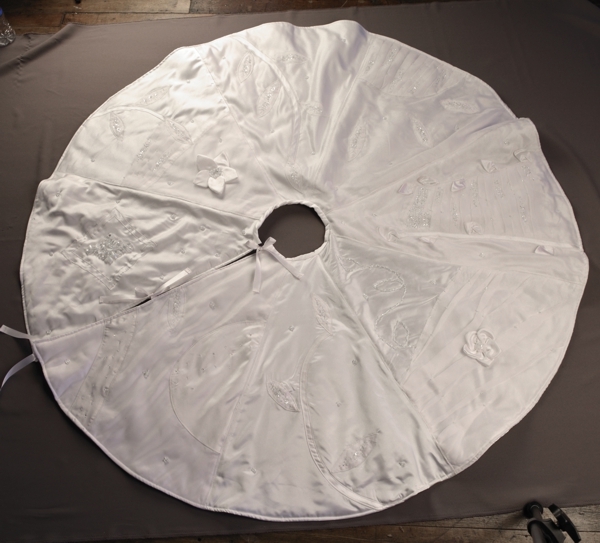 Wedding dress blankets do cost a slight bit more because of the challenge that the materials create. Shipping is an additional $15-$20. 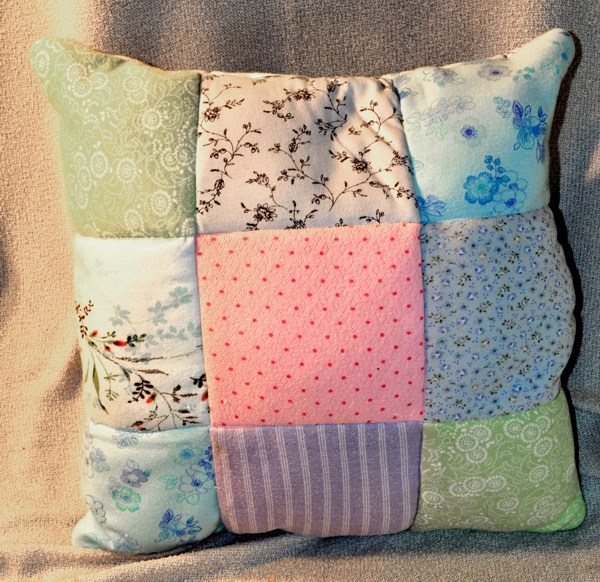 For larger quilts, please feel free to call or email me to discuss what you might like. It doesn’t cost you anything to ask and I don’t bite. $215 for a 36″ square. 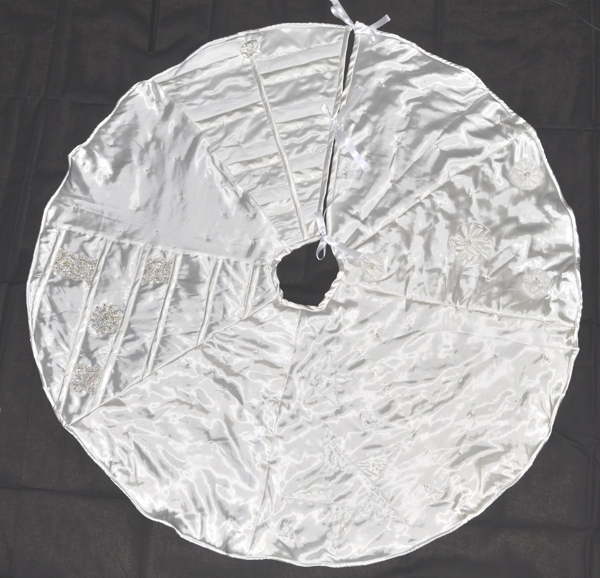 Shipping is $15 for the first skirt and $3 for each additional. 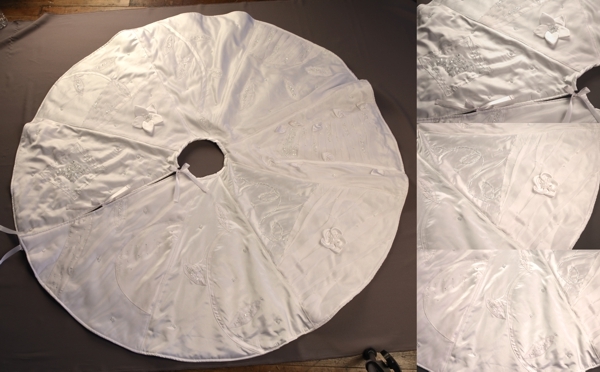 To order, Click Here for a PDF Order Form My measurements are based on measuring across the full circle from edge to edge. 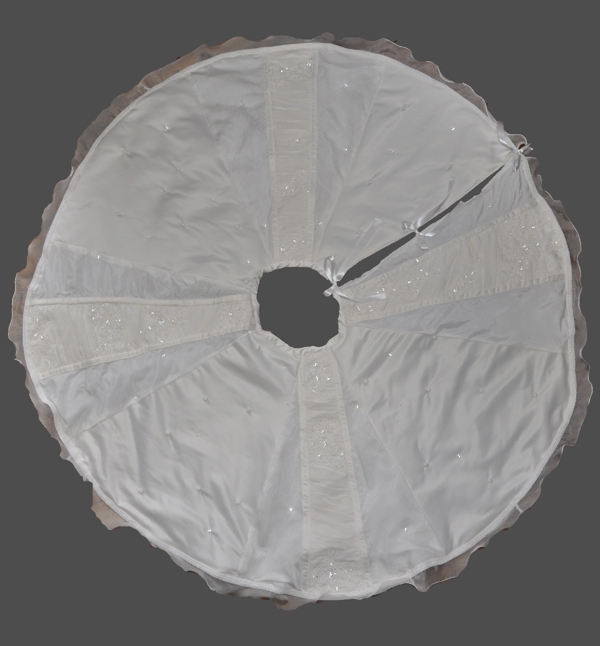 So, the measurement from the tree trunk to the outer edge of the skirt would be approximately half of the total measurement. 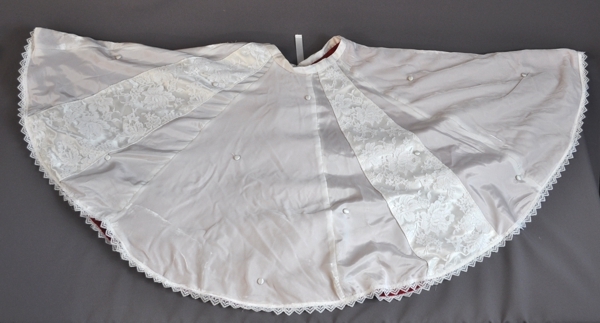 This means a 48″ skirt measures 24″ all the way around from the trunk. 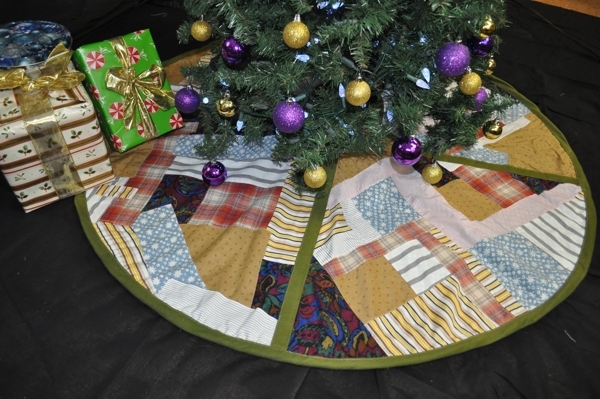 Watch our short video about our Christmas Tree Skirt service. All of the items on this page share the same order form. You can access the PDF order form by clicking on the image to the right or link below. Send your garment (s), along with the order form and deposit. Include any information that you think I need to know about what it is you want. Once I receive your package, I will contact you to discuss how to get you what you want. Reservations are recommended, we work on each project in the order they come in unless different arrangements have been made. If you have something specific in mind, and don’t see it here, please just email me using the form at the bottom of this page. We send out our email newsletter several times a year, usually around holidays, to feature gift ideas.